My homegirl Sarah Albahadily made all the arrangements for our visit to Oklahoma City today, and she’s just about as Oklahoma as you can get. She proudly blasts country music in her car and often wears cowboy shoes under her long flowing abaya dress. On the 4th of July, her mother puts on a headscarf designed like an American flag. 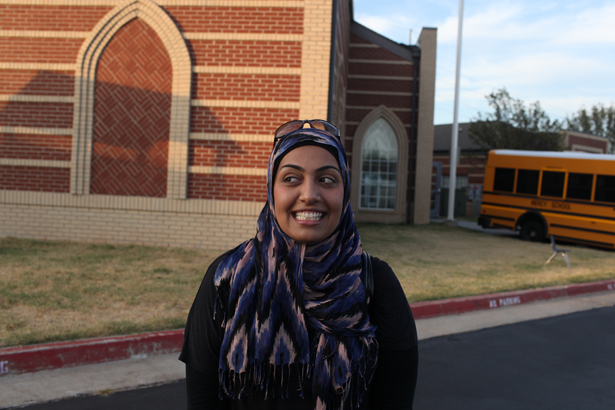 Before you say “Wow, there are Muslims in Oklahoma?” think again. Suhaib Webb, probably one of the most sought after scholars on the Islamic speakers circuit today, is from this state. So is Kareem Salama, who’s got crazy buzz right now as being a Muslim country music artist. I’ve noticed a lot of Muslims that live in smaller towns unfortunately are either embarrassed to live where they live or anxious to jump on the first opportunity to move somewhere else. But what’s relieving about this community is how content and proud people are about living here. I asked Sarah about some of the things she liked to do for fun as a kid and her eyes lit up as she talked about all the rodeos and country music concerts she used to go to. I try my hardest to downplay my secret love for country music, but I can’t resisnt once she started talking about Rascal Flatts and Garth Brooks. 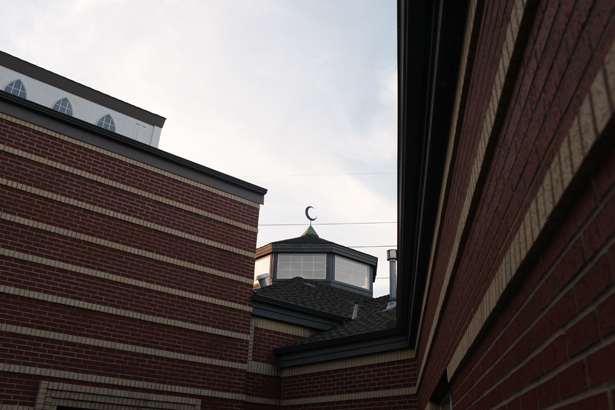 Sarah grew up attending the place we visited today, the Islamic Society of Greater Oklahoma City. 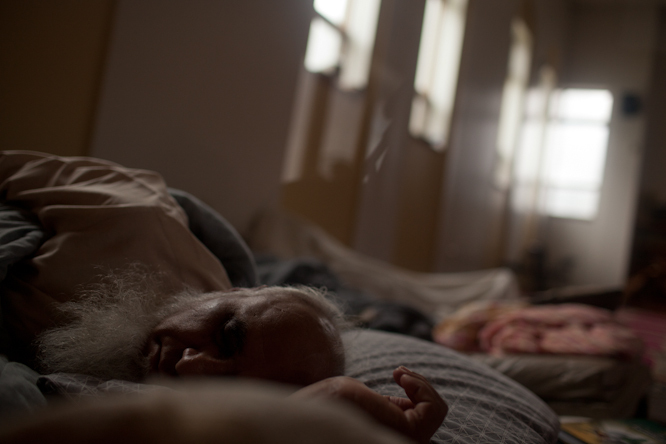 It’s a cozy mosque with radiant architecture that her father helped build. I know it’s incredibly cliche and hokey to point out the diversity inside a mosque, but it was definitely a melting pot in there. I stood outside the mosque’s parking lot as I saw a group of Hispanic Muslims arrive to prayer on motorcycles. Next to them a group of Iranians I overheard talking about a NASCAR race coming up. I found an air hockey table in the mosque’s second floor, which is all the convincing I’d need to come back here again. We head back outside the building and Sarah nervously smirks as Bassam takes photograph after photograph of her in the parking lot. My background in reporting often makes me a little too inquisitive at times, so I decided to ease off my questions for her and just hang out with everyone for the rest of the night. To break our fast, Sarah arranged for a group of about 20 people to hang out with us at ZamZam, an Arab restaurant down the road that’s a popular hangout for many Muslims here. I’ve been burned out a lot on this trip from all the traveling, media interviews and just keeping up with the 30 Mosques site in general. So it was an incredible breath of fresh air to just hang out with a bunch of people and goof off while eating some awesome food. For the two hours at the restaurant we were there, it was great to just forget about all the stress and just have a good time among all my newly made friends. 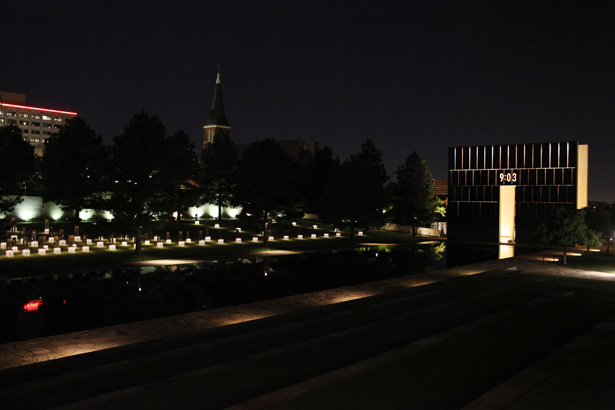 Afterwards, the Oklahoma crew took us downtown to check out the memorial for the infamous 1995 Oklahoma City Bombing. Chills went up and down my arms as I realized I was standing in front of the place where 15 years ago, two white Christian men, orchestrated the bombing of a federal building that ended up killing over 100 people. 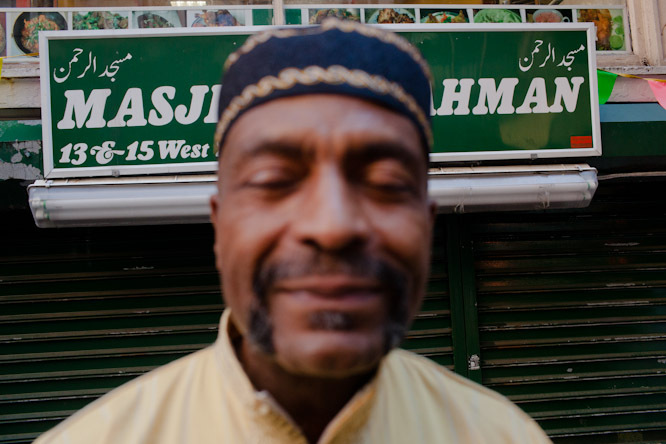 As a Muslim, I realized this is probably the place where racial profiling for us began in this country (Granted, the first World Trade Center bombing happened 2 years before this). Immediately after the bombing, Muslims were blamed for the attacks because two men near the building were apparently seen speaking Arabic shortly before the blasts.The Council of American Islamic Relations (CAIR), had its first major campaign in response to the bombing. And in 2010, Oklahoma City Muslims are arguably still facing backlash simply for who they are. Banning Shariah law is a ballot issue this November for local residents, even though no Muslim really proposed the idea of trying to implement it here to begin with. Candidates running for Congress here are basing their platform simply on the fact that they’re anti-CAIR. But if you think these issues define what Muslims in Oklahoma City are like, think again dude. When I think of Oklahoma, I think of Sarah’s cowboy boots tucked under her abaya or people talking smack about who is a better NASCAR driver. I think we as Muslims need to get out of this dumb two-dimensional mold where we’re only seen to the outside world as people that are victims of hate crimes, have airport security problems, or these days are dealing with opposition to mosques. Sure those are important issues, but why have we allowed those issues to define us? i like ur blog & im reading it regularly ! I think is my favorite post so far! Your experience at this mosque is exactly what I think of when I think of being Muslim in America. Normality! Family, hanging out, blasting music from the car. Though I do not understand the appeal of NASCAR. It is incorporating all the good parts of the US with being a Muslim. And that isn’t as hard as one thinks! It is taking your kids to school, volunteering in Scouts, earning a living, going to friday prayers, helping your community. It isn’t hiding in your little bubble. It is showing non-Muslims who Muslims really are. Very interesting and intelligent story Mr Aman,well done nice work,keep it up,i am looking forward to read the part 2.God bless you guys and stay safe. Really good point. Live and let live. I think part of the problem also is that we ( the community) feel obligated to respond to every allegation. I think someone has a crush on Sarah. She’s very photogenic. I think Aman found the sole mate. I thought these blogs were supposed to be about the mosques and communities. Guess i was wrong. Great post…sitting here in Cordoba, Spain reading this and enjoying the virtual car trip from here. Have sent this to several friends because as your post points out, while there is unity in faith and general practice, the US (and Global) Muslim community is hardly homogeneous. 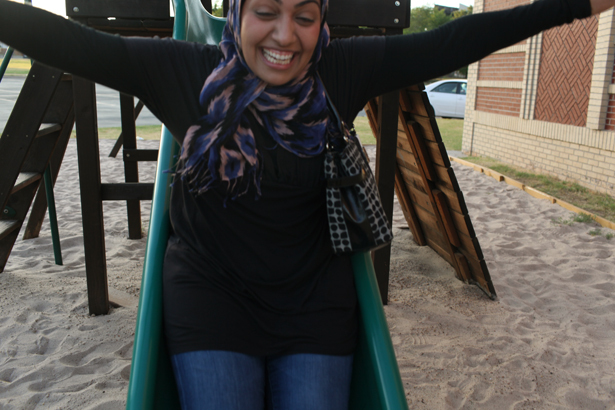 A bit of ill communication there: while American Muslim has become an oximoron in the mainstream, some of us Muslims also condescend to others as if they merely provide fun, disposable, shallow relationships. We present ourselves as façades though it is far from the truth, which of course you help unveil. Garth Brooks???? That isn’t real country. Real country is Willie Nelson, Johnny Cash, Waylon Jennings, Merle Haggard, etc. This gotta be one of my favorite post! You guys are really amazing, and I’m enjoying reading through your journey! Can’t believe it’s half away done. It’s gonna be sad when it’s over. You guys should do a “post 30 Mosques” reflection blog. Mr BQ you are right about our two dimensional image for this society, but this is all going in a positive direction, the way they say in Pakistan “Badnam na hon gay to nam na hoga” You see this society did this with every ethnic group who came to this country,and they were able to crush them in there colors. Muslims religion as itself is a complete culture and way of life, it is frustrating for them that they can not crush us, so they have to blame us for who we are. All we have to do to stick with our values with American touch of freedom then the outcome will be so fascinating, that it will not leave any choice for them to learn about the true Islam. ( which means Peace for all). Salam Alaikum, All brothers and sisters. Please keep up the good job. Let us be good to all humans and let others know that we are here to make life easy and as good as possible because Islam is like a most beneficial tree with full of fruits, cool shade and exhilarating fragrance giving one. Who will not be mesmerised or not influenced if we are down to earth and good to the people and show that we are humble and well wishers of mankind carrying with us a greatest Book and a Message from God Almighty Allah, The Al Qur’an or Koran or Quran sent for all mankind, just like the rain clouds are sent by God Almighty Allah for all humans to take benefit. Do they need anything more to convince that Holy Quran and Islam are for all? These dimensions are set upon us and created by us too. I love to ride horses, snowboard, and play paintball. We use to have a group of Muslims in my area (DC/MD/VA) who would go on ski trips, play paintball, and go on trail rides. We had a diverse MSA and we didn’t have any problems at all. However, a certain group took over and started separating everything we did until the sisters couldn’t do much of anything but have tea parties. I’m glad you’re focused on the diversity within an area because it breaks stereotypes within our own community. For the record Tim McGraw and Faith Hill are the best. Another great post! It might be my favorite too, although the one through South GA/Northern Florida was pretty great, too. Aman, I think you are right on about the Oklahoma City bombing being a sort of turning point. I remember there being discussion of that as well after it happened. And I agree about American Muslims being viewed 2-dimensionally. 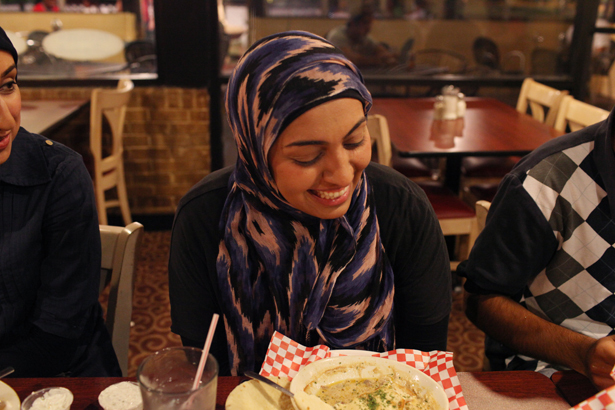 This trip is revealing the lived reality of life for many Muslims in America in all it’s beauty and complexity. It’s just this sort of diversity that reminds me that there are things to be proud about my country (at a time when I’ve had a hard time finding things to be proud of). Keep up the great work guys! These men were not Christians, not even in name only. I’m a Christian, but I often defend Islam’s rights (including the Park51’s rights, NOT a popular stand) and my personal integrity won’t allow me to accuse or malign Muslims falsely; I’d hope for the same godly behavior from my fellow Muslim citizens. Perhaps you spoke out of misinformation. Yay to Hispanic Muslims!!! Havent met any in the States yet… Hope I get to meet some soon! (Im from Panama but I go to college in Florida). Faithful already posted what I was going to but you have ignored them. So, I will post it again…. The OKC bombers WERE NOT CHRISTIAN. You should take that FALSE information OUT of this entry. Otherwise, I am enjoying you posts. Nice ode to Sarah… oh, and her community. & I like Kareem Salama’s song “A generous peace” thanks for putting me/ us on to his music. Good to learn about the different communities. Great post! As a resident of Oklahoma City, you did a great job representing us. Hope to see you in our state again. Great post guys. As a christian and an american soldier. I am looking forward to more posts. My the higher power bless you and your travels and may more people see that just because of a few bad apples.. Well you know the rest! I can’t believe I missed you guys while you were in Oklahoma.. Glad you had a great time! I’m a transplant to Oklahoma (Tulsa to be specific) from my beloved home Colorado since 2007. When I first made the decision to move to Oklahoma I had the same ideas as a lot of people about Oklahoma. White trash, racism, rabid evangelicals, the whole nine. Even as an AWG (Average White Guy) I was worried if I would be accepted with my relatively laissez-faire social views. What I found once I got to know a number of lifelong Tulsans and longtime transplants completely blew my expectations away. Are there unseemly parts of Oklahoma? Well yeah, but show me a place in the world where there isn’t! Most of what I have found in Tulsa has been honest, hard working and down to earth people. Not to mention thriving arts communities, fascinating architecture (the art deco and old oil money mansions in Tulsa to be specific) and the main thing people to be rabid about isn’t religion but college football. Okies don’t seem too concerned about how you worship nearly as much as whether you are a good person. People who are dedicated to family, taking care of others, working hard and occasionally letting your hair down to have a good time usually have no problem putting down roots in Oklahoma. Sometimes I feel kind of like the guy who discovered an awesome greasy spoon restaurant that everyone drives by everyday but never goes in because they have already decided that food is bad/dangerous. But if they’d only step inside oh what treasures they would find! I’ve been away from Tulsa for about 6 months now for work and 3 years ago I never thought I’d say this but…if I ever get back to Oklahoma I just might nail my feet to the ground! Well done my mate, i really enjoy it. I love all of these coach they’re just hence manner and also excellent it feels like most people stepped into any impair. In addition, i similar to the incontrovertible fact that you could produce these in a different way. It is possible to fold the it again through and create the software be like a lower reduce coach or maybe see it a particular example is see with the photo. This really is very legitimate position as increased within your web log. Treasure writing about throughout.